This species is accepted, and its native range is Europe to Central Siberia and NW. China, NW. Africa. Hadinec, J. & Lustyk, P. (2017). 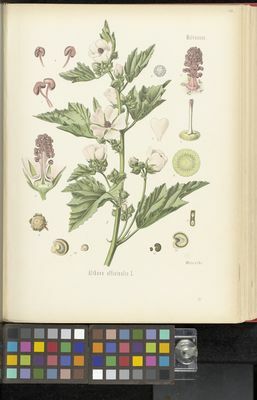 Additamenta ad floram Reipublicae Bohemicae. XV. Zprávy Ceské Botanické Spolecnosti 52: 37-113. Uzunhisarcikli, N.E. & Vural, M. (2012). The taxonomic revision of Alcea and Althaea (Malvaceae) in Turkey Turkish Journal of Botany 36: 603-636.